TwitterFor years, Retired Marine Lt. Col Bill Cowan simultaneously did clandestine work for the Pentagon as he frequently appeared on Fox News as a military analyst. 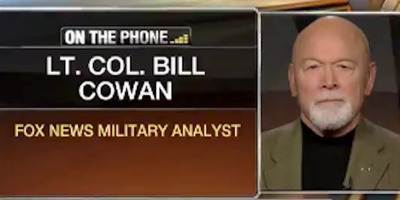 Retired Marine Lt. Col Bill Cowan simultaneously did clandestine work for the Pentagon and appeared on Fox News as a military analysis for years. Cowan is now on the run from law enforcement over financial issues related to his former marriage. Cowan was involved in clandestine operations for the US military from the Vietnam War through the War on Terror. Not long ago, retired Marine Lt. Col Bill Cowan simultaneously did clandestine work for the Pentagon while also regularly appearing on Fox News to discuss military matters. Today, Cowan on the run from the law after a warrant was issued for his arrest when Cowan didn’t deliver on a promised payment to his ex-wife after already spending a brief time in jail in 2015 over related issues, Politico reports. Cowan was involved in clandestine operations for the US military from the Vietnam War through the War on Terror, working to bring down everyone from the Vietcong to high-value targets in Afghanistan. For a significant chunk of that time, following the September 11, 2001 terror attacks, Cowan routinely appeared on Fox News as a paid military analyst. The network reportedly wasn’t aware he was continuing black-ops work in the Middle East at the same time and claimed it wouldn’t have hired him had it known. Cowan was part of a cohort of military analysts who were given briefings and access to classified information by the Pentagon before and during the Iraq War as part of a coordinated effort to “generate favourable news coverage of the [Bush] administration’s wartime performance,” according to a bombshell 2008 article from The New York Times. Cowan apparently doesn’t feel there was any conflict of interest in terms of him appearing on a major news network while also being a spy for the Pentagon. Over the course of his career, Cowan became close with a number of prominent conservatives, including Richard Carlson – the father of Fox News host Tucker Carlson. Cowan regularly appeared at Republican events on top of frequent Fox News appearances in recent years. But all of this began to fall apart around 2015 after Cowan’s arrest. The Pentagon had already severed ties with him by that point, which was allegedly linked to his harsh, highly public criticism of former President Barack Obama. Fox opted not to renew Cowan’s contract in 2016. Roughly a year later, a warrant was issued for Cowan’s arrest and he claims to be living out West in an unfurnished apartment (there are two outstanding warrants for Cowan, one in Virginia and another in South Carolina).